Successfully Added Wuben I333 Iron Man Tactical Flashlight - 1200 Lumen, CREE XPL-V5 LED, Waterproof, 7 Light Modes, Lotus Head, 283M Range to your Shopping Cart. With the Wuben I333 Iron Man tactical flashlight at hand you’ll never be left in the dark again. Holding an extremely durable aluminum alloy design this waterproof flashlight is impact and scratch resistant. 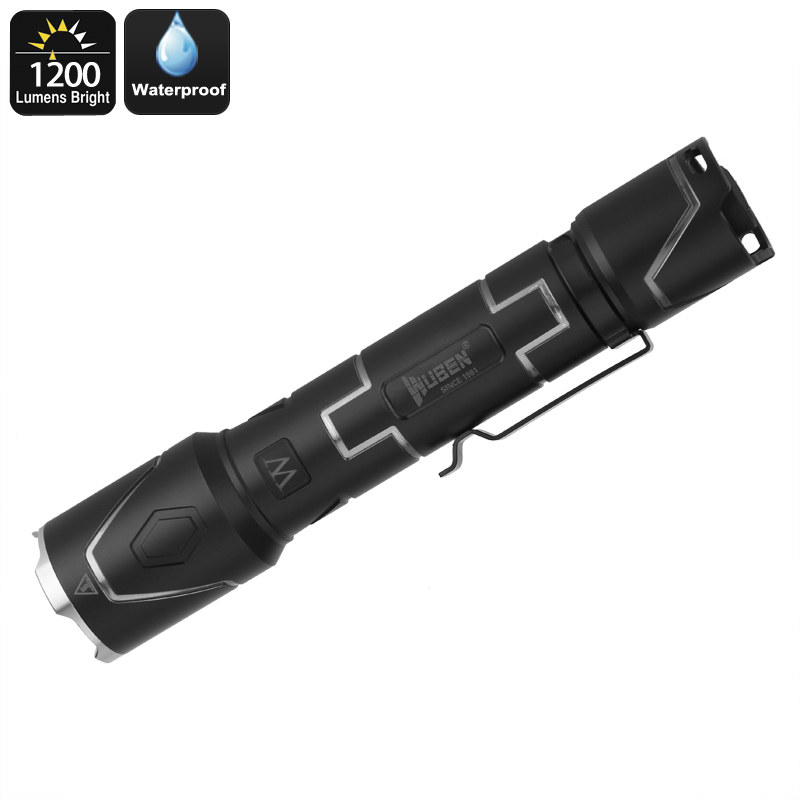 Coming with an IPX8 waterproof rating the Wuben I333 Iron Man flashlight can be used in any weather condition, making this LED flashlight the perfect gadget for any outdoor enthusiast. Emitting a stunning 1200 lumen of light the Iron Man I333 flashlight lights up what ever lays in front of you. Capable of throwing a light beam up to a distance of 283 meters this extremely bright flashlight is guaranteed to provide you with the light necessary to light up any area. Featuring seven different lighting modes you can be assured that this tactical flashlight will always offer the right lighting solution for any imaginable situation. Perfect to have at hand at any time – this flashlight offers a perfect source of light during night time hikes, hunting trips, and camping trips. Packing a massive 2600mAh battery this tactical flashlight provides you with hour’s worth of illumination. A useful power indicator on the base of the torch keeps you updated constantly about your current power level, ensuring that you’ll never unexpectedly run out of juice. With its CREE XPL V5 LED light this torch provides you with a super bright and stable light beam while, at the same time, working in an energy efficient manner. Thanks to this latest LED technology you’ll be able to enjoy this ultimate light source for hours in a row before running out of juice. The front of this tactical flashlight has been equipped with a lotus head, allowing you to easily smash windows and fragile surfaces in case of an emergency. Thanks to its seven different light modes that include inter alia an SOS function, and to its lotus head design, the Wuben I333 Iron Man flashlight is an ultimate emergency tool that forms a great asset to any home or car emergency kit. Coming with a tight clasp at its side this torch can be easily attached to your jeans or bag and carried around without having to fear of losing it. Being the perfect outdoor gadget, this CREE LED torch provides you with all that’s needed to confidently head out after dark. The Wuben I333 Iron Man tactical flashlight comes with a 12 months warranty, brought to you by the leader in LED torches as well as wholesale electronic gadgets..
Arabic: - مصباح LED التكتيكية - Chinese Simplified: - 战术 LED 手电筒 - Czech: - Taktická LED svítilna - Dutch: - Tactische LED zaklamp - French: - Lampe LED tactique - German: - Taktische LED-Taschenlampe - Hebrew: - פנס LED טקטי - Hindi: - सामरिक एलईडी टॉर्च - Hungarian: - Taktikai LED zseblámpa - Italian: - Torcia tattica LED - Japanese: - 戦術的な懐中電灯 - Korean: - 전술 LED 손전등 - Malay: - Lampu suluh LED taktikal - Norwegian Bokmål: - Taktisk LED lommelykt - Romanian: - Lanterna tactice LED - Russian: - Тактический светодиодный фонарик - Spanish: - Linterna táctica LED - Thai: - ไฟฉายทางยุทธวิธี - Turkish: - Taktik LED el feneri - Vietnamese: - Đèn LED chiến thuật.